Pro Tip: Use Azure Files to store the files and scripts you use. That makes them readily accessible to you VMs, with the added benefit of not having to maintain a file server. Every VM with the agent installed should report a value for Ready in the GuestAgentStatus column. You can find your OpsInsights workspace ID in your Operational Insights portal. Your Workspace ID and access keys are displayed on the right. Use the primary key. Azure Active Directory is Microsoft’s cloud identity platform and the identity provider for all the services in the Microsoft Cloud ecosystem. It is a multi tenant global identity platform, available in all the Azure regions. 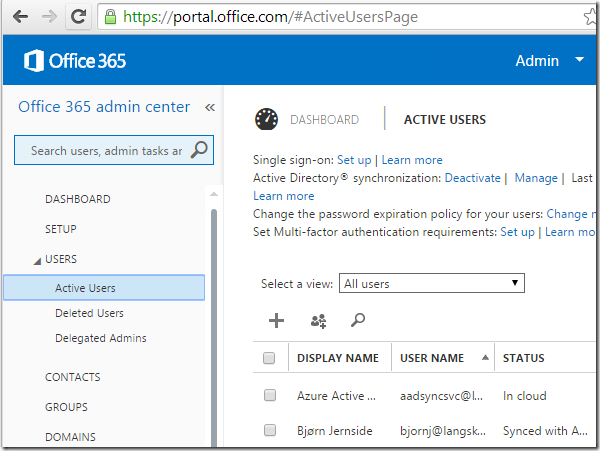 If you have Office 365, Windows Intune or Microsoft Azure; you also have Azure Active Directory. To call it Azure Active Directory can sometimes be a little misleading because although it is part of the Azure platform, it exists outside the other services we generally associate with Azure, like Infrastructure-as-a-Service or Platform-as-a-Service. Even though Azure Active Directory shares its name with the Windows Server Active Directory Domain Services role we find in Windows Server, Azure AD offers a lot more than its earthbound namesake. Azure AD is not just a directory that stores information about users and groups, and authenticates them, it also has identity lifecycle management, advanced reporting, multi-factor authentication and support for OAuth, OpenID Connect and WS-* protocols. The complete feature set is too long to list here, and outside the scope of this post anyway. Azure AD is backed by a REST API called the Graph API. Azure AD comes in three flavors; Free, Basic and Premium. The base offering, Free, can be used by anyone for almost anything. 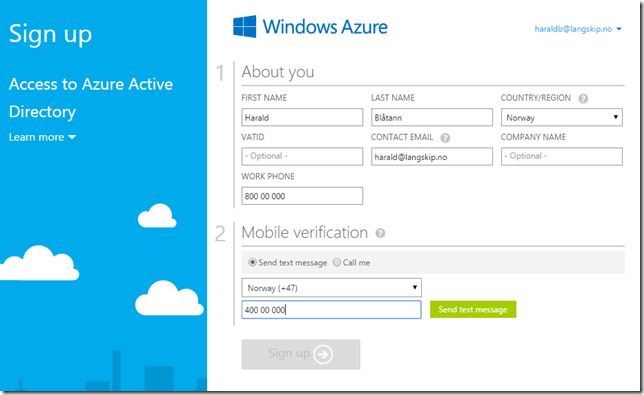 You could build your own webapp in AWS and use Azure AD as the identity provider for example. Like I mentioned, if you already have Office 365, you also have Azure AD. 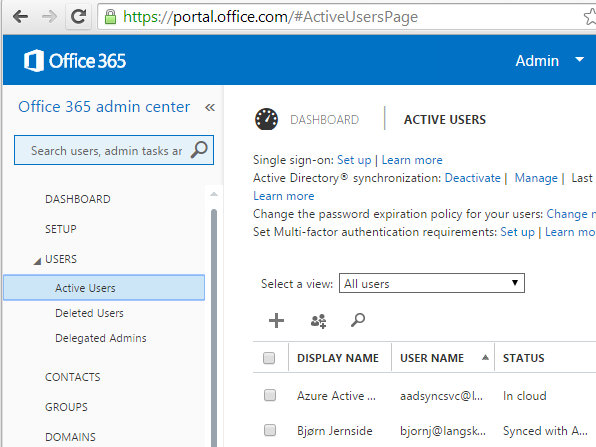 The Office 365 portal offers one view into Azure AD via the admin portal (portal.office.com). As you can see from the list above, it is Azure AD that handles federation and directory integration with your existing on-premises directories, not Office 365. As we’ve seen there are several views into Azure AD; PowerShell, Office 365 or Windows Intune portals. But to manage the full set of available features in Azure AD we need to use the Azure Management Portal (manage.windowsazure.com). If you have an Azure subscription you either got an Azure AD tenant when you signed up, you created one in the Azure portal afterwards or you associated your existing Azure AD tenant with your Azure subscription. 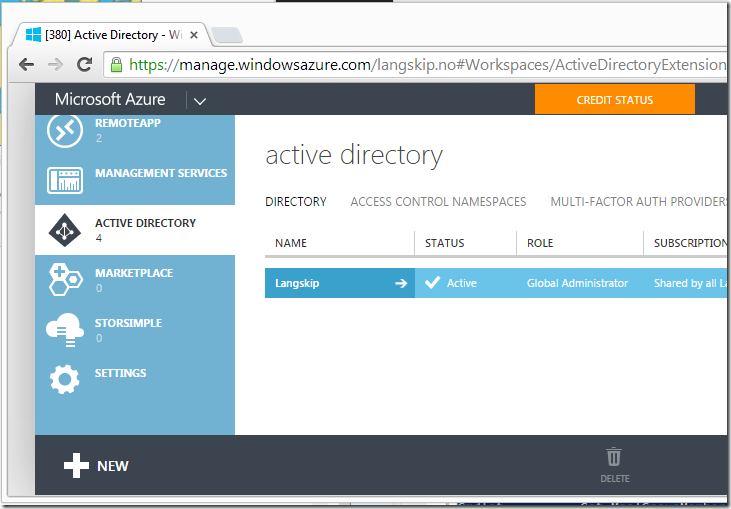 Either way that tenant then becomes visible in the Azure portal like in the screenshot above. From here you can manage all the base functionality of Azure AD like directory integration, domain verification, multi-factor authentication, reporting etc. You can also add users form other Azure AD tenants (provided you have access to the tenant in question) and add Microsoft Accounts (MSA). User Regular user without any special privileges or permissions. Can read most information in the directory (tenant). Password Administrator Resets passwords, manages service requests, and monitors service health. Password administrators can reset passwords only for users and other password administrators. User Administrator Resets passwords, monitors service health, and manages user accounts, user groups, and service requests. Some limitations apply to the permissions of a user management administrator. For example, they cannot delete a global administrator or create other administrators. Also, they cannot reset passwords for billing, global, and service administrators. Service Administrator Manages service requests and monitors service health. Billing Administrator Makes purchases, manages subscriptions, manages support tickets, and monitors service health. Global Administrator Has access to all administrative features. The person who signs up for the Azure AD tenant becomes the first global administrator. Only global administrators can assign other administrator roles. There can be more than one global administrator at your company. More information about the Azure AD administrative roles is available here. 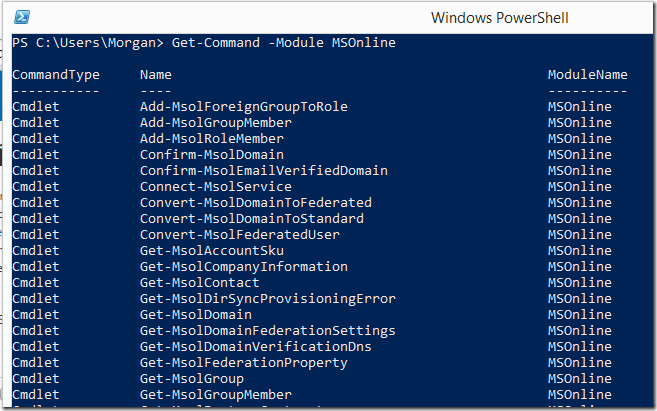 These roles can be granted to either Microsoft Accounts or Azure AD accounts. As mentioned Azure has its own permissions and roles. The only two roles at present is the Service Administrator and one or more Co-Administrators. The users assigned these roles can be either Microsoft Accounts or Azure AD accounts. The Azure Preview portal (portal.azure.com) has support for Role Based Access Control (RBAC) which gives more granular control of resources. The users assigned roles in RBAC are also either Microsoft Accounts or Azure AD accounts. So now we know that you can have two sets of permissions and roles; one for Azure AD and one for Azure. We have also established that to fully manage your Azure AD tenant you need access to the Azure Management Portal, but for that you also need an Azure subscription. You could create a an Azure trial subscription with your Azure AD Global Administrator account, but that might be more than you bargained for and requires registering a credit card and managing that subscription. Or you could add the Azure AD Global Administrator to an existing Azure subscription you have, but that will require you to use an MSA to do the linking and the account must be added as a co-admin, thus granting full access to your entire Azure subscription. This is not a good security practice. You could also manage Azure AD directly with PowerShell, but this would not give you full access to all features. 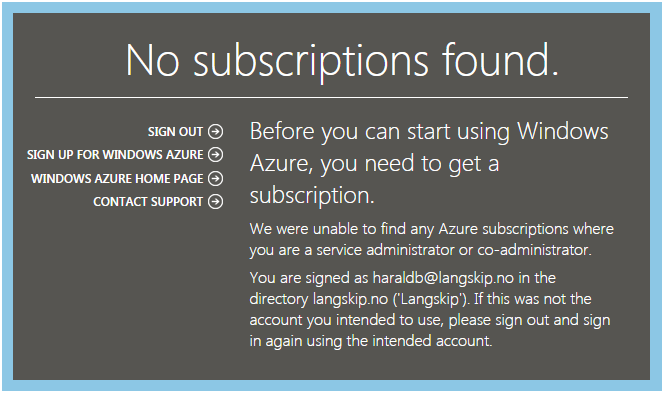 The optimal solution to this would be to let Azure AD Global Administrators log on to the Azure Management portal without a subscription to manage just Azure AD, or to have a separate portal for just Azure AD, but that is not possible. There is however an option that comes pretty close. Make sure you use a clean browser or browser tab where you are not already signed in to any Microsoft services, either Azure AD based or MSA based. Select Sign in with your organizational account and sign in with the Global Administrator account of your Azure AD tenant. 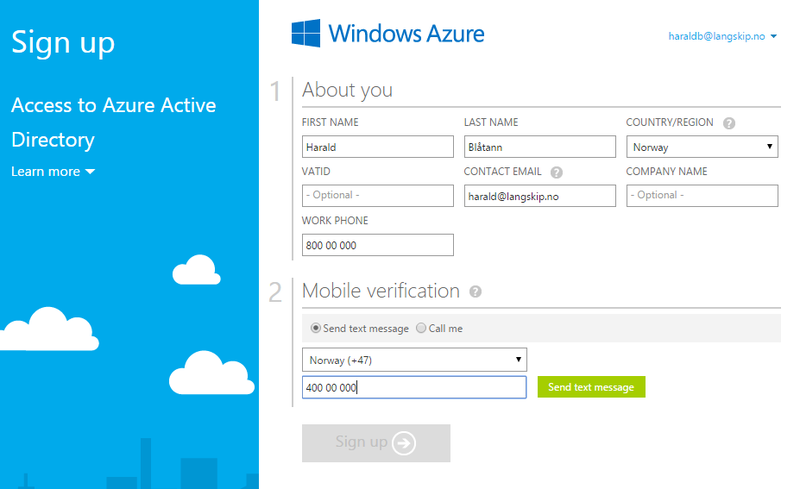 Complete the Azure sign up form, note that the only thing you need to do is verify your mobile phone number. 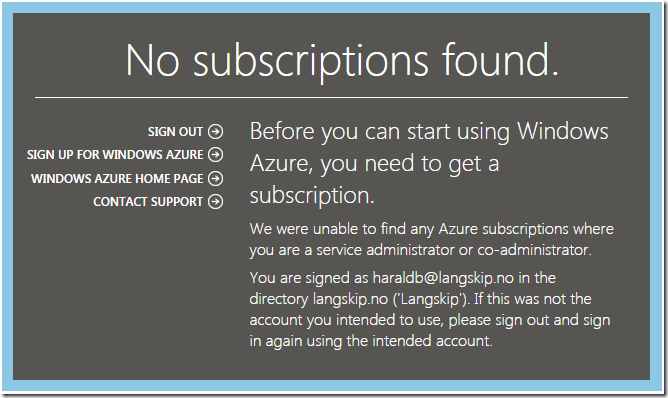 Hit Sign up and you will be forwarded to the Azure Account portal while your subscription is set up. Create an Azure AD only subscription for the first Azure AD tenant following the steps in the previous section. Make the MSA a Global Admin of the other Azure AD tenant you want to manage in your Azure subscription. This can be done either by creating another Azure AD only subscription or in the full Azure portal if the Azure AD tenant in question is associated with an existing subscription. Ask an admin for help if needed. You now have one MSA that is both a Global Admin in your Azure AD only Azure subscription, a co-admin on your Azure AD only subscription and a Global Admin in another Azure AD tenant you want to add and manage from your Azure AD only subscription. Since the MSA can read from both Azure AD tenants you can now add Azure AD accounts from one to the other. Create a user in the second Azure AD tenant that is sourced from the first Azure AD tenant by selecting New User and then User in another Windows Azure AD directory. Make the new user a Global Administrator of the directory. If you wish you can now remove the MSA from both directories and the Azure subscription and only use Azure AD accounts. RFC3927’s title is Dynamic Configuration of IPv4 Link-Local Addresses, and it describes how a host can automatically configure itself with an IPv4 address to communicate with other hosts on the same local link, when no statically configured IP address or DHCP server is available. The IPv4 address space set aside for this is 169.254.0.0/16. Just as RFC1918 defines addresses that can be used for private, routed networks, the addresses in RFC3927 are also private, but even more restricted than those in RFC1918. The addresses from RFC1918 (10/8, 172.16/12 and 192.168/16) will be dropped by any Internet-connected router. The only way to get traffic from a host with an RFC1918 address out on the Internet is through the use of Network Address Translation. On your own network, however, RFC1918 addresses work just as public addresses and can be routed etc. But addresses from RFC3927 will not be routed anywhere, they are what is know as link-local addresses and only facilitate communications on the same link. No router will forward RFC3927 addresses. 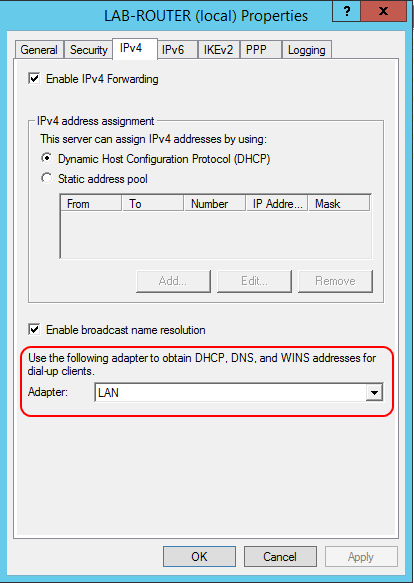 You can test this yourself by leaving your computer set to receive a dynamic IP from a DHCP server, and then making sure that no DHCP server is available, but that your still have a network link. If your computer is RFC3927 compliant it will configure itself with an address in the 169.254.0.0/16 range. RFC3927 defines rules for how to choose an address and make sure your host can keep it once other hosts connect to the same link as you, but it is beyond this post to recite the RFC. Now let’s look at how RFC3927 pertains to Microsoft Azure. Both RFC1918 IPv4 addresses and any public IPv4 addresses you may own, unless they are in conflict with already configured network resources in Azure, can be used. Technically a part of an Azure address space so the same rules apply as for vNets. Probably on of the very first VMs you deploy in your Microsoft Azure IaaS deployment are Windows Server Active Directory Domain Controllers. 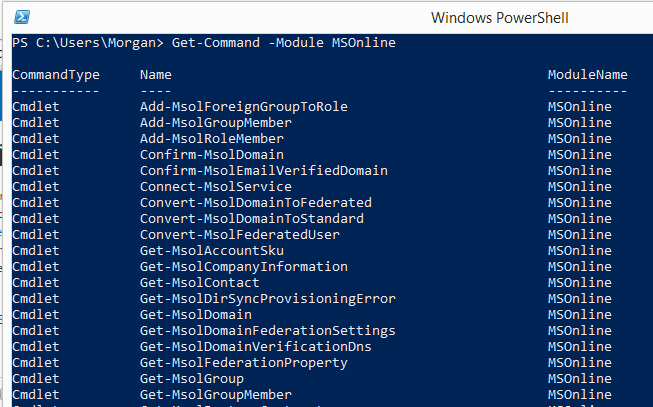 The Active Directory Domain Service is the foundation for pretty much every Windows server application out there, from Exchange to System Center. Running DCs in Azure IaaS works great, just remember that bit about tuning off the host caching on the disk where your DIT is. System error 53 has occurred. All VMs I have tested are in the same region and affinity group as the storage account, which is also in the same affinity group. I have also tested with a storage account outside an affinity group, but in the same region; same result. My preliminary conclusion is that “something” in how DCs handle the browsing for the network path is different from member servers or stand alone VMs. I have no root cause yet, I just thought I should write this up so that anyone else experienceing the same would have some information. Sound of in the comments if you have experienced the same or have a solution. Since my ISP only allows 2 IPs this made the original address I had received on the WAN interface invalid. But why did it happen? The default setting is Allow RAS to select adapter. This was the cause of my problem. The RRAS service selected my WAN interface and send out a bunch of DHCP Discover messages to allocated IP addresses for incoming clients. This invalidated my existing DHCP lease and stopped all communication on the Internet. Once I selected the internal (LAN) Interface I could connect fine. I guess this problem can occur in any S2S or RAS scenario where the WAN IP address is dynamically assigned. You usually don’t create the unattend.xml file manually, but rather use a tool like Windows System Image Manager from the Windows Assessment and Deployment Kit (ADK). I recently had an issue where none of my new VMs would join the domain during provisioning, leaving them all in a workgroup. That led me to compile the following during my debugging. 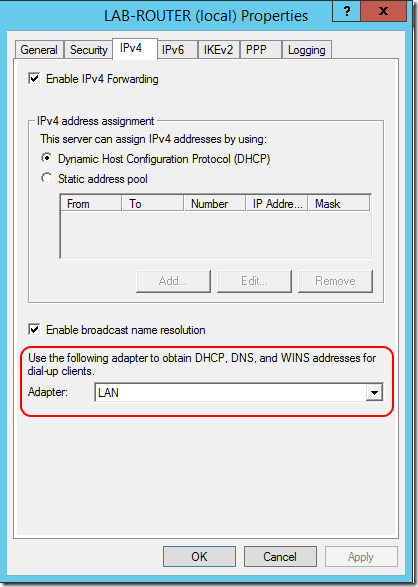 Domain NetBIOS name of account with permission to join computers to domain specified in the JoinDomain parameter. This is usually always the NetBIOS name of the domain from JoinDomin, but could be from another domain in the forest or a trusted domain. This info is loaded into the unattend.xml file used to setup the new VM. After that the unattended setup process continues as with any regular Windows install. If domain join does not work there are several logs that should be examined. 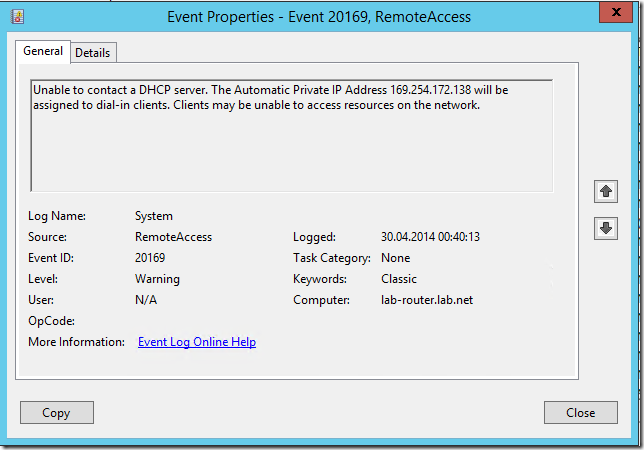 Under Management Services in the Windows Azure portal you find the Operation Logs. The provisioning of a new VM is an AddRole operation, first one with Status Started and then another one with Status Succeeded. By examining the details of these you can see what is passed to the back end. This is particularly useful if you are using scripts which pass variables to the domain join parameters. Here you see exactly what is passed. Note that the password is omitted from the logs, that is not an error. The first thing you should do is check unattend.xml and verify that it contains the correct info. 2014-03-11 14:09:45, Info [DJOIN.EXE] Unattended Join: Checking that auto start services have started. Info: The machine SERVER1 attempted to join the domain corp.mydomain.comDC2.corp.mydomain.com but failed. The error code was 2. 03/11/2014 22:24:44:423 NetpCheckForDomainSIDCollision: returning 0x0(0). I have highlighted my particular error. As you can see I specified the DN of the computers container as the location of the new computer object. Since Computers is in fact a container and not an OU, the NetpCreateComputerObjectInDs function fails. After I specified a bona fide OU in my Add-WindowsAzureProvisioningConfig cmdlet the VM was successfully joined to my domain. If you actually want the computer object to be placed in the Computers container just omit the MachineObjectOU parameter from Add-WindowsAzureProvisioningConfig. Since the Computers container is the default location for new computer objects, unless redirected by the admin or overridden, your VMs account will end up there. What is Product use Rights (PUR)? 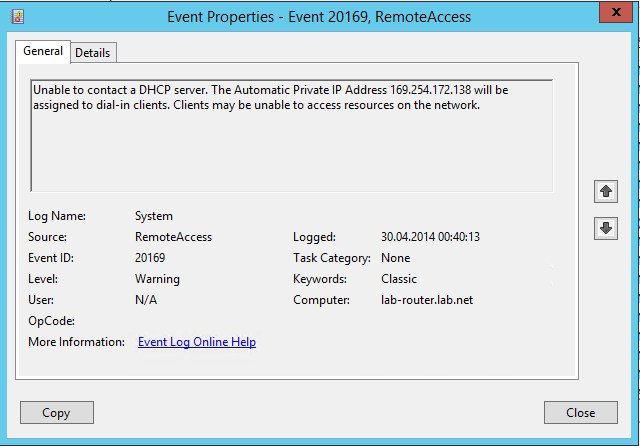 Today, RDS CALs permit remote access to the Windows Server GUI (Graphical User Interface) running on a customer’s on-premise server and RDS SALs (Subscriber Access License) if running on a shared-server environment. Effective January 1 2014, RDS User CALs will have Extended Rights through Software Assurance. In addition to the on-premise access, RDS User CAL customers will also be able to access the Windows Server GUI running on Windows Azure or on a third party’s shared server, without acquiring a separate RDS SAL. This RDS User CAL Software Assurance benefit allows each User to access RDS functionality only on one shared server environment (i.e. Windows Azure or a third party server) in addition to access the respective on premise servers. The customer must acquire extra RDS SALs (Subscriber Access License) if the same User needs to access RDS functionality on additional shared server environments. This is indeed great news for all customers wanting to access a remote Windows Server Desktop in Windows Azure or at another third party hoster.